Photo: Current Chair, Farid Rohani (back), and former Chair, Beverly Nann (front), of the Laurier Institution. Photo by Myungsook Lee. The Laurier Institution, a national non-profit, non-partisan organization, has been developing conversations on “multicultural issues” in Canada since it was founded by prominent business and community leaders in 1989. It plays a key facilitator role in Vancouver, assuming intellectual leadership on Canadian diversity by promoting awareness and pubic discussion. 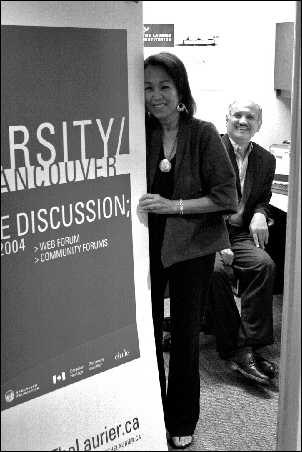 Of particular importance, a series of significant community forums were held in 2004, and another in 2005 which asked, “What is the Future of Multiculturalism in B.C. ?” These forums led to progressive discussions on “multiculturalism,” followed by ongoing public and online events in “Diversity/Vancouver.” Recently, we met with current Chair, Farid Rohani, and former Chair, Beverly Nann, of the Laurier Institution to listen to their experiences at Laurier, and their views and visions of “diversity” in Canada. The Laurier Institution allows ideas to prosper and garners an audience for these ideas. ‘Multiculturalism has evolved,’ explains Farid. It has transformed itself through many different lives. ‘One of our speakers, Will Kymlicka, spoke clearly about the need for dissection of the word “multiculturalism.”’ Kymlicka is a respected political philosopher at Queen’s University and Farid agrees that “multiculturalism” needs scrutiny. Farid has been a member of the Laurier since its inception in 1989. He became Chair of the Laurier Institution in September, and in November will succeed former Executive Director, Don Black, who helped found the Institution in 1989. Farid is a successful businessman who also studied political science at UBC. Among his many accomplishments are serving as Vice President of the Vancouver Asian Heritage Month Society, Chair of the Scouts B.C. Diversity Advisory Committee, and on the marketing committee of the Provincial Council of Scouts Canada. Beverly Nann has been with the Institution right from the beginning too. A social worker by profession, Bev is a founding (and continuing) Board Member and Past Chair herself. Working in the field of immigration and multiculturalism for more than 30 years, she has received several honours, and has pioneered various services for newcomers. She has generously agreed to act as a resource person for our interview today due to her extensive knowledge of the history of the Laurier. The Institution progressed ‘from the ground up.’ By approaching people, Bev got policy makers and leaders involved in examining Canadian multicultural issues. They, in turn, brought others into the discussion, and that’s how the Laurier got started and grew. It continues this strategy of engaging people, focusing on policy issues and areas of tension, and it continues to flourish. Acting in an educational capacity, the Laurier creates forums for discussion, backed by research. Typically, the Laurier selects a topic based on community input, and follows this up with research and dialogue. It conducts research relevant to cultural diversity and subsequently supports communities in their efforts to create dialogue with each other. It also nurtures the integration of new groups into society in a number of ways. Forums and lectures are offered throughout the year, and each February a number of special events are organized.